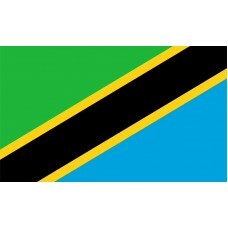 The Tanzania Flag features a black diagonal line with a yellow border beginning from the bottom left hand corner and ending in the top right-hand corner. The upper triangle is in the color green and the lower triangle is in the color blue. The green color represents the country's natural vegetation and "rich agricultural resources" as well as the peace of the country. The blue color represents the Indian Ocean and the many lakes and rivers that Tanzania is home to. The black color represents the native Swahili people and their black skin and is a reminder that all the people are the same and no one should be divided. 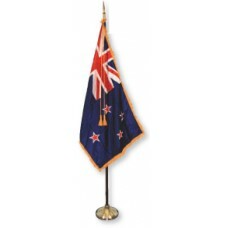 The yellow color represents the country's mineral wealth and "rich deposits in the land." The Tanzania flag was adopted on June 30th, 1964 in order to replace the two separate flags that were used for Tanganyika (Tanzania) and Zanzibar. The Tanzania flag incorporated the color of both the separate flags into the one flag. The Tanganyika flag featured three horizontal bands in the colors of green, black, and yellow and the Zanzibar flag featured three horizontal bands in the colors of blue, black, and green. 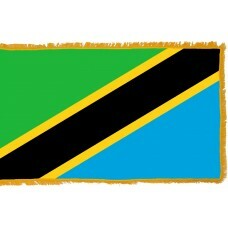 The flags were incorporated into the Tanzania flag as a sign of respect, equality, and unity. Tanzania is a country that is located in Eastern Africa and shares borders with Kenya, Uganda, Rwanda, Burundi, Democratic Republic of Congo, Zambia, Malawi, Mozambique, and the Indian Ocean. The capital city of Tanzania is called Dodoma (it was declared the capital city in 1974). Prior to that, the capital city was Dar es Salaam which is also the largest city. In the late 19th century, Tanzania was conquered by Germany and it was incorporated into German East Africa. 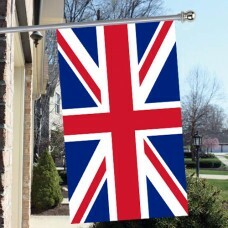 It remained a part of this until 1919, when it became a British Mandate. In December 1961, Tanzania (Tanganyika) gained independence from Britain and Zanzibar (also a British protectorate) gained independence in January 1964. Following their independence, the two states merged. Tanzania is considered to be one of the poorest countries in the world. The main export that the economy is reliant on is the fish from the Lake Victoria. Tourism is also a major factor and contributor to the economy and Tanzania is home to plenty of landmarks and sights. One of Tanzania’s main attractions is Mount Kilimanjaro which is the highest peak in Africa. It is a free-standing mountain (doesn't belong to a mountain range) which makes it the tallest free-standing mountain in the world. Mount Kilimanjaro is home to three volcanic cones which are, "Kibo," "Mawenzi," and "Shira" which are all dormant volcanos. Tanzania is home to three of the biggest lakes in Africa which include, Lake Victoria (the biggest lake in Africa), Lake Tanganyika (the deepest lake in Africa) and Lake Nyasa. The Serengeti National Park has also become a famous attraction due to the migration of wildebeest that it sees and the 250,000 zebras.